Wander-Lindsey: Holiday Gift Giving Guide + Coupon Codes! Holiday Gift Giving Guide + Coupon Codes! Christmas has always been my absolute favorite holiday. I love the smell of the fresh pine Christmas tree that we cut down ourselves every year. I love baking and decorating sugar cookies with three generations of my family. I love decorating the house with reds and greens and little candles in every window. And yes, I even love the snow. Where I grew up, it was a rare occasion when we didn't already have several feet of the fluffy white stuff by Christmas morning. My favorite Christmas tradition though, is the gift giving. I really enjoy watching my loved ones open a gift I hand-picked (or handmade!) for them. Since I'm not very crafty, I tend to buy most of the gifts I give. Although I do try to find gifts that other people have made (think Etsy) so that the gifts are more original and often personalized. Below are my favorite gift ideas for every member of your family. Plus several coupon codes to help soften the blow your wallet is bound to take this holiday season! Is a mixer a little out of your price range? Head over to LOFT for their $35 and under event and grab her this adorable marled cowl-neck sweater. They also have awesome jewelry, comfy pajama sets and cozy slippers, all for under $35! My dad loves to read and is constantly buying books so I figured why not buy him a Kindle. 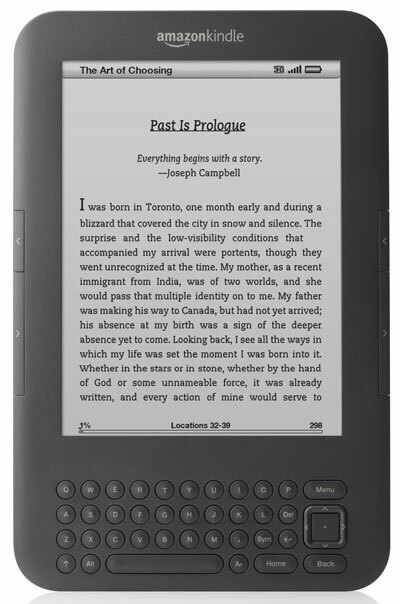 You can buy one for as low as $79 from Amazon.com or if you spend a little bit more you can get the Kindle Fire which allows you to browse the internet, play games and watch movies & tv along with downloading and reading your favorite books. How about golf? Most fathers like to golf, right? Problem is my dad already has a nice pair of golf shoes, I wouldn't know how to pick out the proper driver (I once bought him a women's lefty club... oops.) and he has enough golf shirts to choke a horse. 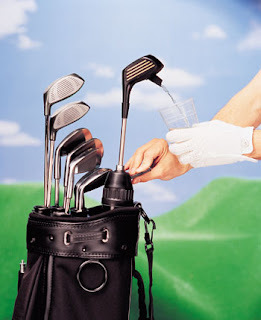 So how about this hilariously useful golf club drink dispenser from Overstock.com! My brother is currently a senior in college and while I know he is having a blast, I also happen to know that he is often eating meals out of a can so he can save money for umm, nights out "studying" with friends. So I figured why not send him or her some yummy meals he can grill or cook himself. 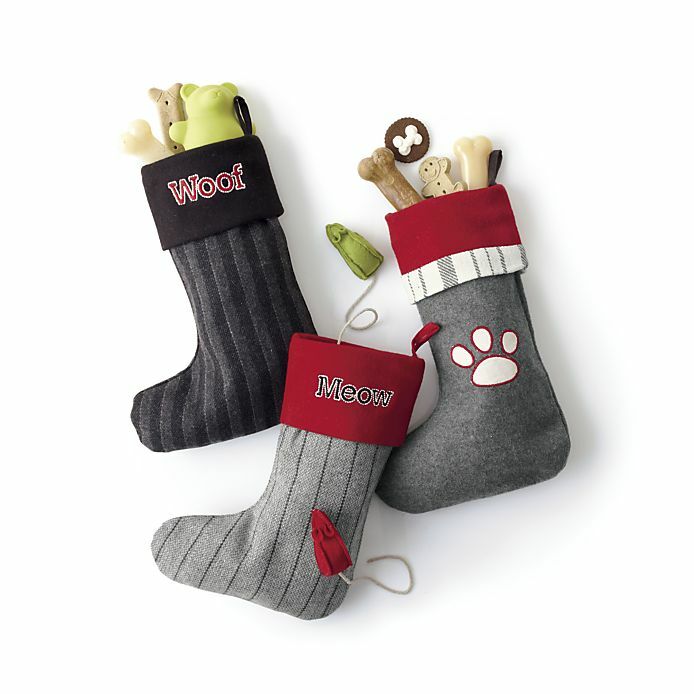 Omaha Steaks has plenty of gifts to choose from for under $50! Don't think they will ever cook for themselves? 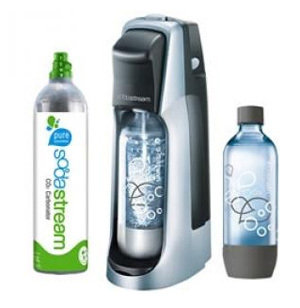 Why not give the Keurig for the college world, the Soda Stream. This cool little gadget let's you turn water into your own soda, flavored sparkling water or energy drinks. You can buy it for around $100 at Bloomingdale's, Bed Bath & Beyond, and Kohl's, to name a few. Victoria's Secret is still offering their tiered coupon code FALL11 PLUS free shipping on all orders over $25. They have the cutest colored cords, sweaters, and fur-trimmed boots that could be the perfect addition to your sister's closet. Who knows, you might even have to "borrow" these plum cords. You know, just to pay her back for all the times she borrowed your favorite things. Or get an extra 30% off already reduced items at J.Crew using coupon code MUSTHAVE! This cable knit sweater will go perfectly with the plum cords. And at $35, you can't go wrong. Obviously you'd be girlfriend of the year if you bought him an iPad2. But not all of us can shell out several hundreds of dollars for one so what's a girl to do? 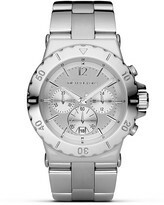 I love this stainless steel watch from Michael Kors. Or I'm always a big fan of giving a gift certificate to your favorite spa for a nice, soothing massage. It's like "thank you for putting up with me all year, go relax for an hour!" And it secretly benefits you too. But shh, we won't tell him that. I got one of these for Christmas a few years ago and I LOVED it. So much so that I want to give them to all of my friends. 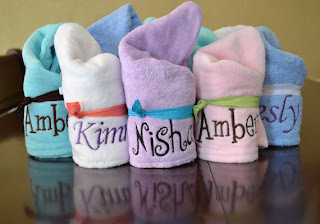 These personalized wrap towels from Etsy are so cute and practical, who wouldn't love them?! 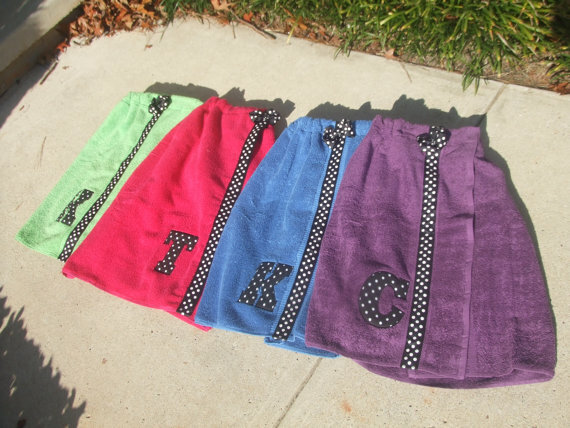 Need a gift idea for a neice, goddaughter or any other little girl for that matter? I love these turby twisty towels for your hair. Every girl needs one! Banana Republic: Save 30% on full-priced styles using coupon code BRPARTY now through Sunday, 11/20. French Connection: Get 30% off your purchase during their friends & family event using coupon code AW11FF. Ann Taylor: Use coupon code WINTER30 and save 30% on your order. Orders over $150 receive free shipping as well! Neiman Marcus: Free shipping on any order using coupon code FSNOV. 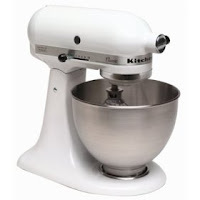 Saks Fifth Avenue: Earn up to a $450 gift card using coupon code NOV2011. See website for details. Also get free shipping on ANY order using coupon code HOLIDAY. Steve Madden: Free shipping on any order using coupon code HOLIDAY. Plus check out their fall sale and get up to 30% off fab pumps, oxfords and booties. ASOS: Use coupon code SAVE20 and get 20% off everything! Hurry, this deal expires 12am PST, Monday, November 21. Kate Spade: Enjoy 20% off their featured holiday sweaters. No coupon code needed! Tobi: Now through November 20, get 30% off your entire order using coupon code EARLYBIRD30. Hope my gift ideas have helped a bit! Looking for a coupon code that you don't see listed above? Let me know and I'll help you find it!